Wow, you guys! I can't believe I've been writing this thing for three years as of today! One hundred and thirty reviews. That's a lot of fake meat consumed. I spent some time trying to think of something that would be worthy of a third-anniversary post, and I'm going to take the suggestion of my lovely wife - she thought it would be good to give you all a list of the fake meats that I (still a staunch omnivore) have eaten, even after writing the review. I decided, after thinking about it, to break it down into a few categories. First category: foods that I buy and eat regularly (usually when they're on sale). These are two items that are actually in our freezer at the moment, and one that would be, if my local store didn't stop carrying them. But when they were available, I ate a bunch of them. The first item is something that I have had for breakfast multiple times this past week: Morningstar Veggie Sausage, Egg, and Cheese Biscuits. Man, these are still so good. I've got the cooking of these down to less than 4 minutes, but with oven-quality results. How, you ask? Well, 30 seconds in the microwave, and then 3 minutes in my toaster oven. Piping hot with a nice crunchy biscuit. Hard to go wrong with this breakfast. The other one currently in my freezer is Morningstar Italian Herb Chik Patties. Once again, rather than sacrifice quality by cooking it in the microwave, or take lots of extra time by baking in the oven, I do a combination - about 30 seconds in the microwave, just to get it started, and then about 3 minutes in the toaster oven to crisp it up. I do usually just eat this on a plate with a fork, but the last time I ate it (last week) I melted some mozzarella on it and ate it with some leftover linguine and tomato sauce. Yum! My other would-be regular, if my local Target still carried it, is Yves Veggie Corn Dogs. I ate a lot of these back when I could get them, and I still pine for them. I saw them during our last fake meat stock-up trip, but we were already getting more than a dozen fake meat items, so my wife said we shouldn't get them. But at least if a major corn dog craving hits, I know where to find these. The second category would be foods that we have eaten again, but that we don't pick up very often. The first thing in this category would be Lightlife Smart Deli Pepperoni. We make a lot of pizza at our house - usually about once a week. On the rare occasion I get a hankering for pepperoni, this is what I generally use. Now, just to clarify - my own personal preference is for real-meat pepperoni. There's something about how the pepperoni curls up, with crisp edges, and that little puddle of grease in the center of it that appeals to me on a very weird level, as long as I don't think too much about it. My wife, however, does not have that weird grease-appreciation level, so we don't get to eat a lot of pepperoni. But with this fake pepperoni, we get to enjoy the pepperoni flavor but without the grease puddles that if I'm honest with myself, I shouldn't be eating anyway. Next up in this category would be Morningstar Hickory BBQ Riblets. This could have potentially fit into the first category, as we do have a box of these in our freezer, but they've been there a very long time, so I decided to put them here instead. I'm not the biggest fan of the whole barbecue experience, so we mostly have these for my wife. She LOVES them, when she actually remembers to eat them. The other two things I'd put in this category sort of go together, as far as explaining why they're here. These are sort of the best-in-show items for their respective categories, at least so far. When I want a hamburger-like veggie burger, I go to Boca All-American Flame Grilled Burger and when I'm looking for a fake meat crumble, I pick up Morningstar Crumbles. 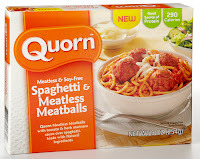 It's not terribly often that I choose a veggie burger for myself over a real-meat burger, or fake ground beef over real ground beef, unless I'm testing a product for review purposes, but when I'm feeding vegetarians, these are what I go for. The final category I decided on is items that I would (or should) eat again. First up would be a couple items by the same brand: Vegetarian Plus Vegan Black Pepper Steaks and Vegetarian Plus Vegetarian Chicken Drumsticks. Let's cover the steaks first. I genuinely enjoyed eating these - I didn't eat them all in one sitting, so for a few days they sat in the fridge with the mashed potatoes. Once I finally got back to them, I didn't have terribly high hopes for them. However, they were still quite tasty, and I think I enjoyed them even more the second time. And when I think back on it, I kind of wish I had more. If I could remember where I saw these, I'd definitely go buy more and eat them. For the drumsticks, I gave them a crappy score. I was informed in the comments (and I honestly don't know why this didn't seem hugely obvious to me at the time) that the microwave is the worst way to eat these. I did say in my review that once the rubbery texture faded from my memory (which it has) I'd be willing to try them again, but with another cooking method. So once I find the black pepper steaks, these will probably be nearby, and I'll pick up another box. And finally, I wanted to specifically mention this homemade seitan pepperoni. This was not only a tasty recipe, but it helped clarify the entire purpose of fake meat for me, so it has a special place in my memory. I'd definitely make this again, but probably only if I couldn't find the Lightlife Pepperoni, or if I were really trying to impress someone. I mean… making your own pepperoni is really something special. So those are my favorite products I've encountered over the past three years of writing this blog. It's been a long and crazy ride, with lots of disasters along the way, but some delicious highlights as well. I can't promise I'll be able to keep doing weekly reviews, what with this baby on the way (due in October! ), but I'll do my best for you all, and keep putting my taste buds on the line for science! 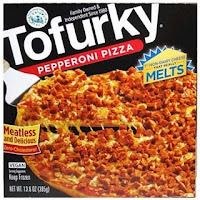 This week, another frozen pizza: Tofurky Pepperoni Pizza. I was reasonably pleased last time I had one of these, so I was pretty optimistic. So let's get started! First, I baked the pizza as directed. This went smoothly, although the smells coming from the oven were not terribly delicious. I started getting nervous once I pulled the pizza out. The sheer amount of pepperoni covering nearly the entire surface of this pizza was a little overwhelming. That was where the funky smell was coming from. In the picture on the box, there are little visible patches of cheese, but not so on the actual pizza. Crust-to-crust pepperoni. Yikes. But how did it taste? Well, like eating a big mouthful of vegan pepperoni, and not much else. I knocked about 30% of it off, so that it looked like the picture on the box, and tried it again. This time it tasted like pepperoni pizza. Not a great pepperoni pizza, I'll admit, but I could actually discern other textures and flavors, so that was better. When toned down a bit, the pepperoni had a pretty good flavor - nicely spicy. The cheese was, once again, just sort of gooey, or creamy - not quite what I look for in a cheese. And the crust was extremely thin and crispy. Like, paper-thin. Just barely enough structure to hold up the mounds of pepperoni. The combination of the super-thin crust and the gooey cheese layer made it seem like the crust was just underbaked on top, but it was just the cheese. Not a horrible experience, but a little weird. My friend Dan (if you missed his guest post, click here!) was unfortunate enough to eat this with me, and had a slightly less favorable opinion of it. He boldly declared it "the worst pepperoni pizza I will eat" and that "it kinda makes me wanna die". So, not a complete success in my house. And again with the three meager servings - Dan and I split it, and then made some tater tots to finish filling us up. This is a tiny pizza. I'm not even kidding. Be forewarned. It's been a while since I reviewed an Yves product, so here one comes! It's not a new product, so I'll actually be able to give you a proper link this time. Take a gander at Yves Veggie Meatless Ground Round Original. I haven't had great experiences in the past with Yves products (except for their corn dogs…mmm) so I was a little nervous. I decided to go a fairly safe route (no, not tacos) and make a shepherd's pie. I pulled out my favorite don't-feel-like-spending-hours-in-the-kitchen-cookbook, The Best 30-Minute Recipe and dug out their skillet shepherd's pie recipe. Quick swap out the lamb for the Yves crumbles, and ta da! Dinner! Okay, I did use beef broth, and worcestershire sauce, so the meal wasn't technically vegetarian, but neither am I. Feel free to use your own recipe without those things. Anyway, that's how I prepared this fake meat. How was it, you must be wondering by now? Well, it was actually pretty darned tasty. Plain, the crumbles had a vaguely savory flavor, with that gluten-y undertone present in so many fake meats, but it was pretty mild, so I figured it'd play nicely with other flavors. Texturally, it wasn't perfect, but it certainly wasn't mushy. There was a definite ground-beef-y chew to it, and the more of it I ate, the less I noticed the oddness of it. Overall, a good result! I wouldn't suggest trying to bind these crumbles into a burger patty or meatballs, but mixed into a spaghetti sauce or cooked with a nice taco seasoning of your choice, it'd likely be a winner.